Home carbonating systems, whether you want to carbonate water, juices, soft drinks or even re-fizz soda that has gone flat, have been around for decades. These machines were big, bulky and the carbonating cylinders were large and expensive. While newer ones are more compact now, they still take up valuable counterspace. Another modern soda carbonating systems allows you to instead use fairly inexpensive C02 cartridges that you insert into a canister that holds the liquid to push gas in. They can be found in many hardware stores, online, and even major department stores. This allows virtually anyone to carbonate any type of liquid they desire, and one of the best and most compact units is the SodaPlus SP76327 Soda Carbonating Starter Kit. Get the SodaPlus here on Amazon. We have also reviewed other popular soda making machines of both the carbonating tank variety and the charger variety. The SodaPlus starter kit comes complete with a lovely stainless steel 1.2 liter container, a funnel, a gas valve cover for carbonating, a CO2 holder, 10 CO2 cartridges and a regular screw-on cap. You will have virtually everything you need, right out of the box, to begin carbonating beverages as soon as you get it unpacked. The stainless steel bottle is rugged and heavy duty, so you can keep storing your fizzy beverage inside after it has been carbonated. It has a fill line to 1.2 liters, so you’ll never overfill the bottle. The directions are easy to read and understand, and virtually anywhere you can put a 2 liter bottle, the SodaPlus bottle will fit there as well. One of the best things about the SodaPlus carbonator is its simplicity in use. You fill it up with the beverage of your choice, screw on the gas valve cap, insert a CO2 cartridge and it will automatically discharge into the bottle. Shake it around for about 30 seconds, then let it sit for between 5 and 10 minutes. Press the gas relief valve and unscrew the cap. You’ll have a carbonated beverage that you can pour into a cup or a glass. Each of the parts can be rinsed under a faucet or hand washed, and that is really all there is to it. 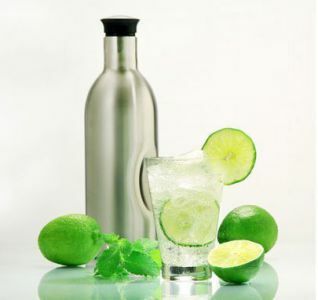 The stainless steel bottle can be used for just about any liquid. The CO2 cartridges can be found almost anywhere. This complete kit comes with everything you need right out of the box. Once the cover is screwed into place, there won’t be any spills or leaks. Shaking the bottle once the CO2 has been added is critical to carbonation. The longer you shake, the fizzier the contents will become. Also, letting it sit several minutes after shaking allows the gas to settle and disperse through the liquid. Doing both of these things will make a wonderfully carbonated beverage every time. Here’s a hint. Take some food-grade petroleum jelly and coat the o-rings on the covers. Not only will this provide a more effective seal, but it will also remove almost all the friction during sealing, and the result will be far less wear and tear on the o-rings themselves. You can use standard 8g CO2 chargers to keep the recurring cost low. You don’t have to fill up the canister fully. If you want a fizzier liquid, pour in less. If you have kids, they will love carbonating anything! Easy, fast and safe to use. Virtually any type of beverage that you have, from flat soda to flavored drink mixes and even fruit juices can be carbonated in the SodaPlus. Solid and durable and will last a lifetime. The price is right compared to some other carbonating systems. You will need to use 1 CO2 cartridge every time you carbonate a beverage. If you have a party or kids, you may find yourself going through a lot of cartridges very quickly. After carbonating, the fizz will start to dissipate everytime you open the canister, so it’s best not to store the drink for long after the first serving. You MUST shake and let the beverage sit after initial carbonation, or the liquid will come out flat. There are a lot of pieces and you’ll need all of them to make this work effectively. If you lose one, this isn’t going to work, so you’ll always have to keep the kit together. You MUST release the excess gas after carbonating is complete, or there could be a soda eruption when taking off the cover. Only hand washing and no dishwashing, except for the bottle. The SodaPlus is one of the new wave of home carbonation units, and it is a good one at that. Although it may seem a bit complex at first, it is really easy to use and better still, it works well and puts the fizz back into any drink. Although it is terrific for a family or anyone who loves carbonation in their drink, it would also make a great addition to any home bar. You could carbonate your own seltzer water, or make a delightful fizzy drink without all of the muss or fuss.